We already know he's mad, but does he have a dark side as well? This men's polyester costume includes a black vest with black and white stripes on one side and checkered on the other side featuring swirled buttons. The black jacket has foam shoulder pads, black and white edging, swirled buttons, and checkered inset on the sleeve cuffs. The black pants have white pinstripes and an elastic waist for comfort. The white bowtie has black skulls and top hats detailing while the top hat has a checkered band and a cardboard sign that says "10/31". Also included are fingerless gloves and shoe covers. 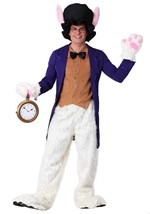 Give the classic Mad Hatter costume a dark twist this Halloween!